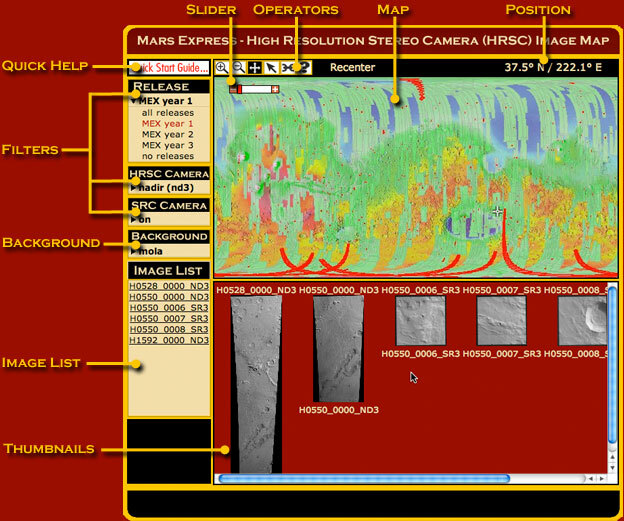 The web map lets you find High Resolution Stereo Camera and Super Resolution Channel (SRC) images for areas on Mars just by pointing and clicking. In essence, the process works as follows. Begin by zeroing in on a particular feature or area using the map. Then use filters to identify images available for that location. Finally, open the images and download them. Each map element (Operators, Background, etc.) has a specific function, described below. At the end of this guide are some useful hints and suggestions. Clicking this icon pops up a highly condensed guide to finding HRSC images, aimed at first-time users. Operator buttons control what a mouse click on the map does. After you click the Zoom In operator button, a mouse click on the map recenters the map on that point and zooms in by a factor of about 2. You can zoom in repeatedly. Distortion will occur in some areas, because the map is a simple cylindrical projection. After you click the Zoom Out operator button, a mouse click on the map recenters the map on the point and zooms out by a factor of 2. You can repeat this until the whole map is visible. After you click the Pan operator button, a mouse click on the map recenters the map on that point without changing the magnification. After you click the Select operator button, a mouse click anywhere on the map looks for a HRSC image covering that point. If any exist, a link for each image appears in both the Thumbnail frame and the Image List. Click either the thumbnail or the reference number to open a new browser window with details of that image and downloading options. Clicking the Link to this Page operator button creates a link in your browser's address window that captures the current filters, map background, zoom-in state and chosen images. If you save the link as a Bookmark or a Favorite, you can return to that point at any time. Clicking the Help operator button opens this user guide. The position display gives the Martian latitude and longitude of the mouse point in degrees and decimals of a degree. Latitude is given first and runs from 90° north to 90° south. Longitude increases eastward from 0° to 360°, measuring from the central meridian. The slider control gives users an additional method of changing the map resolution by a factor of 2 or more. Clicking the + icon on the slider causes the map to zoom in by a factor of 2. Clicking the - icon on the slider causes the map to zoom out by a factor of 2. Clicking or dragging on the slider's red bar between the + and - icons, allows the user to jump instantly to any valid map resolution. You can search for images by choosing among three filters: Release, HSRC , and SRC Camera. The two camera filters are acted upon independently by the Release filter. 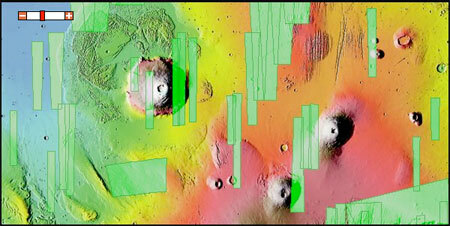 The Mars Express (MEX) began observing Mars in early 2004, which we label as MEX year 1. A year on Mars lasts roughly 687 Earth days. All releases are grouped by the mission year* in which the data were collected. (When the map loads, a release has been chosen.) Selecting a different release updates the map, showing the images from only that time period. * This year count started when the spacecraft (Mars Express, or MEX) arrived at Mars. For the purpose of long-term observations, however, scientists also have a chronological Mars year count, which began April 11, 1955. In this chronological system, MEX year 1 occurs near the end of Mars year 26. Choosing all releases redraws the map to show the footprints of all images that meet the chosen camera filters (see below). Choosing MEX year 2 retrieves image footprints from the second mars year since the start of the mission that also meet the options in the HRSC and SRC filters. Choosing none clears the map of all footprints. Choosing a HRSC filter refreshes the map and shows only footprints of images corresponding to the chosen image product. This filter divides the HRSC imagery into three categories: nadir, dtm, and orthophoto. HRSC image footprints are shown in green on the map. Choosing nadir (nd3) shows the footprints of all HRSC nadir (map projected) images for the time range specified in the Release filter. Choosing dtm (dt4) displays the footprints of HRSC dtm (topographic) images for the time range specified in the Release filter. Choosing dtm (dt4) displays the footprints of HRSC orthophoto (corrected for topography) imagery for the time range specified in the Release filter. Choosing none clears the map of all HRSC footprints. Choosing this filter refreshes the map and allows the user to toggle the SRC footprints on or off. SRC image footprints are shown in red on the map. Choosing on shows the footprints of all SRC images for the time range specified in the Release filter. Choosing off clears the map of all SRC footprints. All background maps are simple cylindrical projections and have a resolution of roughly 64 pixels per degree, or about 1 kilometer (half a mile) per pixel at the equator. The projection becomes increasingly distorted toward the poles. Choosing albedo displays a grayscale surface map derived from Viking Orbiter data. At right is an albedo thumbnail of the Valles Marineris region. Choosing shaded relief displays a grayscale shaded-relief map created from Mars Orbiter Laser Altimeter (MOLA) topographic data. At right is a shaded-relief thumbnail of the Valles Marineris region. Choosing mola displays a vividly colored shaded-relief map derived from Mars Orbiter Laser Altimeter (MOLA) topographic data and United States Geological Survey (USGS) digital maps. At right is a mola thumbnail of the Valles Marineris region. The mola background is the default choice when the map loads. Choosing mola 2 displays a traditionally colored shaded-relief map derived from Mars Orbiter Laser Altimeter (MOLA) topographic data and United States Geological Survey (USGS) digital maps. At right is a mola 2 thumbnail of the Valles Marineris region. What you see on the map reflects your current choices of resolution and background. In this example, the user chose to display HRSC orthophotos, represented here as green strips, on mola color shaded-relief map centered over the Tharsis region. The Image List gives the reference numbers of any HRSC or SRC image footprints that cover the map spot the mouse clicked on (in Select Mode). In the example at left, three images were found. The id ending with ND3 is a nadir observation. The SR3 suffix on the other two ids indicate they are SRC images. Clicking any of the links would pop open a window providing detailed information about the image. When you choose the Select operator (see above) and click on the map, the Thumbnails frame shows small versions of any HRSC or SRC images covering the spot the mouse clicked on. In this example, one HRSC and two SRC images were found. Clicking any thumbnail pops open a window giving detailed information about the image and choices of image formats for downloading. If the map appears cluttered with image footprints, try zooming in closer or adjust the release range to be more restrictive. Likewise, zoom in further if you have difficulty clicking on a particular image footprint. HRSC and SRC images directly over the poles are not displayed on this version of the webmap. As you gain familiarity with Martian geography, you may find the grayscale shaded-relief background lets image footprints stand out most clearly.